The opening scene of MISS MEADOWS seems to promise a black comedy whose tone lies somewhere between EDWARD SCISSORHANDS Tim Burton and SERIAL MOM John Waters. 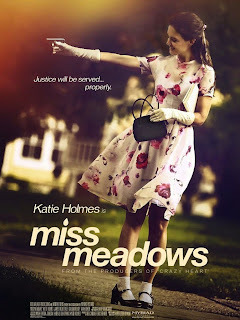 The titular character, portrayed by Katie Holmes, is minding her own business tap dancing down the street in fifties housewife garb. A passing truck driver likes what he sees and trots out his tackiest pick-up lines, escalating to vulgarity when he's rebuffed. Finally, he resorts to pulling a gun on our seemingly demure protagonist, ordering her to get in his vehicle. Miss Meadows offers up one final warning, then produces a gun of her own and shoots the driver dead before merrily starting on her way again. Miss Meadows may a perky well-mannered substitute teacher on the surface, but beneath that exterior lies a merciless vigilante. The sleazy truck driver is neither her first victim, nor will he be her last. This opening scene works because, while the character of Miss Meadows is somewhat over the top, so is the truck driver. Maybe not by much, as anyone who has seen the recent viral video sensation “10 Hours of Walking in NYC as a Woman” is aware, but enough so that the two characters could reasonably inhabit the same universe. The scene is funny, it's edgy, and it grabs the viewer's attention. Unfortunately writer/director Karen Leigh Hopkins doesn't stick with that tone for the rest of her film. Sometimes it veers more towards seriousness as when it delves into the damaged psyche of its protagonist. Other times it flirts with light romantic comedy as Miss Meadows finds unlikely romance with the local Sheriff (James Badge Dale) investigating her killing spree. On occasion the film feels like a gritty low budget violent revenge flick. And every once in a while it comes back to the off kilter satireit started with. We just never know how we're supposed to be looking at any given scene until we're well into it. Staying over the top could have worked. Playing the material straighter and more serious would have been fine. Just pick a tone and stick with it. It also doesn't help matters that MISS MEADOWS feels ambivalent about its central theme of vigilante justice. Miss Meadows is a likeable character, and her victims scumbags, all unequivocally guilty of the crimes they are executed for, including mass murder and pedophilia. But Miss Meadows is also clearly suffering from mental illness, and at one point the film makes a convincing case that there are uncomfortable parallels between Meadows and at least some of her victims. And then it never really follows through on that. There's still enough here that's fresh and odd enough that I suspect MISS MEADOWS will pick up a cult following. The film also boasts a strong performance from Katie Holmes, who almost manages to sell us on this cartoon character living in the real world. And for our Cleveland readers, the film was shot here. Looks like a lot of Edgewater Park and Tremont and/or Ohio City, but aside from a little hometown pride that neither adds nor detracts from a film that had potential but never really came together. 2 ½ out of 4 stars.